President Morsi and the Muslim Brothers were defiant, but it appears that the army held the high cards. 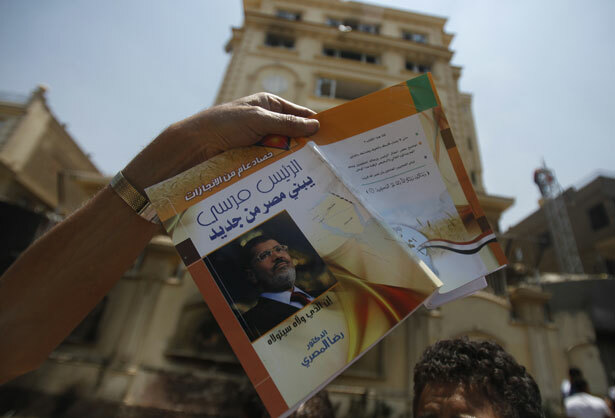 UPDATE 3:45 pm: What does the fall of the Muslim Brotherhood and President Morsi mean? First, Egypt is not Algeria. When Algeria’s military overthrew an elected Islamist-fundamentalist regime in the early 1990s, a horrible civil war resulted. That won’t happen in Egypt, in part because the military has overwhelming popular support. And if the Muslim Brotherhood chooses a violent path now, it will be crushed. The fall of Morsi also means that the Muslim Brotherhood–linked Syrian rebels, including their Al Qaeda allies, are far more isolated now. That ought to aid in finding a negotiated settlement in the Syrian civil war. Morsi’s fall also bodes ill for Prime Minister Erdogan in Turkey, a Muslim Brotherhood–backed Islamist who is also facing a popular rebellion, though in different circumstances. UPDATE 3:30 pm: It’s over. (Or it’s just beginning.) Morsi is out. The odious Muslim Brotherhood has been pushed to the sidelines. Its broadcasting channel is off the air. There’s jubilation in the streets of Egypt. The armed forces would never turn a blind eye towards the aspirations of the Egyptian people. The armed forces will always be out of politics. The Egyptian people called on the armed forces to fulfill the goals of the revolution. The armed forces understood the demands of the Egyptian people. We are committed to fulfilling our responsibility. Since November 2012, we have called for a national dialogue, which was accepted by all parties except the presidency. We have made many proposals to get out of the current crisis. We met with the Egyptian president on 30 June, 2013, during which we rejected any threat to the Egyptian people. We were hoping for reconciliation that would fulfill the aspirations of the people. However, the president’s address did not live up to the expectations of the Egyptian people. So we called for a meeting involving different parties, without excluding anyone. Our roadmap consists of: 1- Suspending the constitution. 2-Holding early presidential elections. The High Constitutional Court head will be in charge of the country until then. 3-Forming a national coalition government. 4-Forming a committee to look into amendments of the constitution. Taking measures to include the Egyptian youth in the decision-making process. The armed forces call on the great Egyptian people to abstain from violence and resort to peaceful protest. UPDATE 2:45 pm: Military forces are moving into place in Cairo, Alexandria, Suez and other Egyptian cities, as it appears that the military and the opposition have struck a deal. Egypt’s leading Muslim and Christian clerics and the leader of the liberal opposition alliance Mohamed ElBaradei will jointly present a roadmap for a political transition shortly, state news agency MENA said on Wednesday. The announcement follows talks with military chiefs who gave President Mohamed Mursi an ultimatum to share power, which has now expired. The generals would be present at the announcement along with members of the Tamarud youth protest movement, MENA said. The clerics would be the Grand Sheikh of Cairo’s Al-Azhar institution, a leading authority in the Muslim world, and Pope Tawadros, the head of the Coptic Church and leader of Egypt’s millions of Christians. Here’s how I understand the situation. Two years ago, as Mubarak was ousted, the armed forces—desperate to protect their privileged position in Egypt—made an arrangement to support the Muslim Brotherhood, which was the most powerful player in 2011. But as the Muslim Brotherhood made a mess, including clumsy efforts to create an authoritarian power position for itself, protests grew—and the population of Egypt abandoned the Brothers in droves. (Muslim Brotherhood supporters are just 28 percent of the population according to polls, with 70 percent opposed.) So, now the military will seek a deal with the opposition Rebel coalition and with Mohamed ElBaradei, the nominal leader of the civilian opposition to Morsi. That’s not necessarily a bad outcome, if the army leaders back a broad-based, civilian bloc that has roots in the secular, anti-Muslim Brotherhood movement that led the initial protests against Mubarak in 2012. UPDATE 12:45 pm: It looks like President Morsi is finished, but there are signs that the military and the opposition want to avoid bloodshed. With a potentially violent showdown looming between Egypt’s military and backers of its Islamist president, the country’s top generals summoned civilian political leaders to an emergency meeting on Wednesday to discuss a new interim government while moving to restrict the president’s travel—a new signal of an impending military takeover. A top presidential adviser said a coup already was under way. As I write these lines I am fully aware that these may be the last lines I get to post on this page. For the sake of Egypt and for historical accuracy, let’s call what is happening by its real name: Military coup. UPDATE 11:30 am: The 4:30 pm Cairo deadline for the military’s ultimatum to President Morsi has come and gone, and there’s been no action or statement from the armed forces. What does that mean? In Cairo, no one seems to know. The establishment newspaper Al Ahram—which, according to some reports, has been taken over by the army—is reporting a live update on its website. For the time being, Al Ahram’s reporting appears to be very objective, and a good source for the latest news. Al Ahram reports that across Egypt, protesters—siding with the army—are setting up roadblocks, gathering at key locations, and holding rallies. The president’s office have issued a statement reaffirming Morsi’s commitment to the roadmap announced in his speech yesterday, which includes the forming of a coalition government and a committee to amend the constitution. I don’t believe that Morsi’s “road map” will be enough for the street protesters and Rebel, the opposition coalition. But it might be enough for the army to strike a deal. It’s all unclear, for the time being. According to other reports, the army is arresting aides to Morsi, including his bodyguards, and they’ve surrounded the main Cairo broadcasting station. UPDATE 10:15 am: The Obama administration is curiously aloof during Egypt’s crisis, with President Obama traveling in Africa, Secretary of State Kerry dealing with Syria in meetings with Foreign Minister Sergie Lavrov of Russia and the Pentagon refusing to confirm whether or not Secretary of Defense Hagel has spoken with his Egyptian counterpart, the leader of the would-be coup makers. Publicly, the United States is adopting a neutral posture, urging both sides in the showdown to compromise and to avoid violence. An important aspect of the crisis is the huge blunder committed by Anne Patterson, the US ambassador in Cairo, who in April weighed in heavily on the side of Morsi and against the protesters. As a result, she is being pilloried by the street opposition, which calls her an “ugly old crone”—and worse—and the anti-Morsi opposition is blaming the United States for supporting the Muslim Brotherhood. In April, she pushed back on the idea that the military—a secular institution revered by most Egyptians—should once again play a more active role in running the country. The generals oversaw Egypt until Morsi’s election last summer. 10:00 am: In Egypt, the deadline for the military’s ultimatum to President Morsi of the Muslim Brotherhood is here. It’s looking more and more like there will be a military coup, in concert with the anti–Muslim Brotherhood opposition forces, Rebel. If the military ousts Morsi and ushers in a technocratic, transitional government, appoints a civilian panel to draft a new constitution—replacing the Islamist-backed one that was rammed through in a rigged referendum in late 2011—and then organizes new elections, that will be a good thing. At least, it will take the odious Muslim Brotherhood down a peg or two. But if the army holds on to power—which often happens when Third World militaries (or Greek juntas) seize power—that’ll be a very bad thing. Another bad thing: if the crisis deteriorates into something like civil war, which could happen if the Muslim Brotherhood covertly organizes its own paramilitary arm. They didn’t indicate into which category Morsi falls. I’ll be adding regular updates here during the day, so stay tuned. Is Egypt on the brink of civil war? Read more of Bob Dreyfuss’s reporting on the situation here.